TOO TALL FOR THE DXA TABLE? For decades, the ‘gold standard‘ for measuring body composition was hydrostatic weighing. However, today dual X-ray absorptiometry (DXA) is considered the ‘gold standard’ for the assessment of body composition. There are a number of reasons for this, which we discussed, in an earlier blog (Dengel & Bosch, 2018). One thing to know about DXA, is that all DXA devices have a weight and a height limit. For most DXA devices, the height limit is 78 inches (6 feet. 6 inches or 1.98 meters) for the scanning area. The limit in height is not too surprising since the Center for Disease Control and Prevention (CDC) estimates that less than 1/15th of a percent of males in the United States are taller than 78 inches (Fryar et al., 2012). However, in the world of athletics, the percentage of athletes taller than 78 inches is considerably greater. Sports like basketball and volleyball place a premium on height. Even in sports like football, the percentage of athletes taller than 78 inches is much greater than the normal population. Almost 8% of all invited athletes to the National Football League (NFL) Combine for the last 5 years were taller than 78 inches (Pro Football Reference, 2019). Can you measure someone taller than 78 inches on a DXA table? The height limit does not mean you cannot measure an athlete who is taller than 78 inches, but it does mean you will have to place the athlete on the table and lose some scanning measurements at either the head or feet since one of those areas will have to be outside of the measuring area of the table. 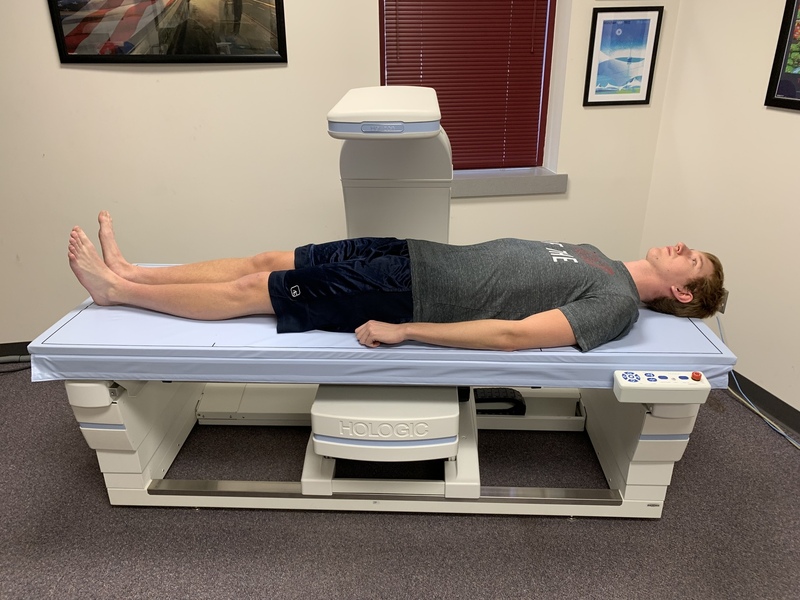 Most DXA manufactures will tell you that when measuring someone taller than 78 inches to position the head at the top of the table and place the feet outside the scanning area. Although this is a reasonable solution, in a number of sports, the lower limb is so vital to the sport that losing part of the legs is not something you would want to do. Another solution is to align the individual’s feet at the end of the table and allow part of the head to be outside of the scanning area (see image 1). One of the benefits of having the head outside the scan area is that the head is primarily estimated from a body composition and bone density perspective, partially because of the difficulties in mapping muscle, fat, and bone in the head. In fact, in children and adolescents body composition does not include the head for a number of reasons, the main one being the density of the head at this stage of development is somewhat variable. For adults, the density of the head is much more consistent, however the amount of fat and muscle mass involved in the head is relatively small, so losing a portion of it will have little effect on overall amounts of muscle mass or fat mass (image 2). What about supporting the head? Some of you may worry that the head being unsupported will be uncomfortable for the athlete. 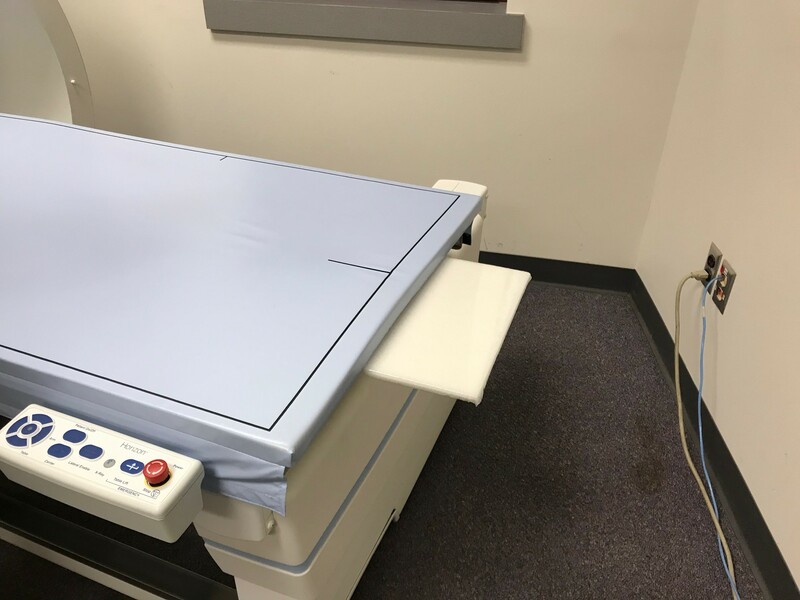 Although the scanning area of most DXA devices is 78 inches, the tables themselves are actually longer than 78 inches so the table will often provide support for the head even if the individual is taller than 78 inches. We have found that individuals up to 82 inches (6 feet 10 inches or 2.08 meters) experience no discomfort with their head lying outside of the scanning area. This covers almost 99% of all athletes, and for those individuals taller than 82 inches we often support the head using a small support device made from RohaCell® (Evonik Resource Efficiency GmbH, Essen, Germany) (see image 3). 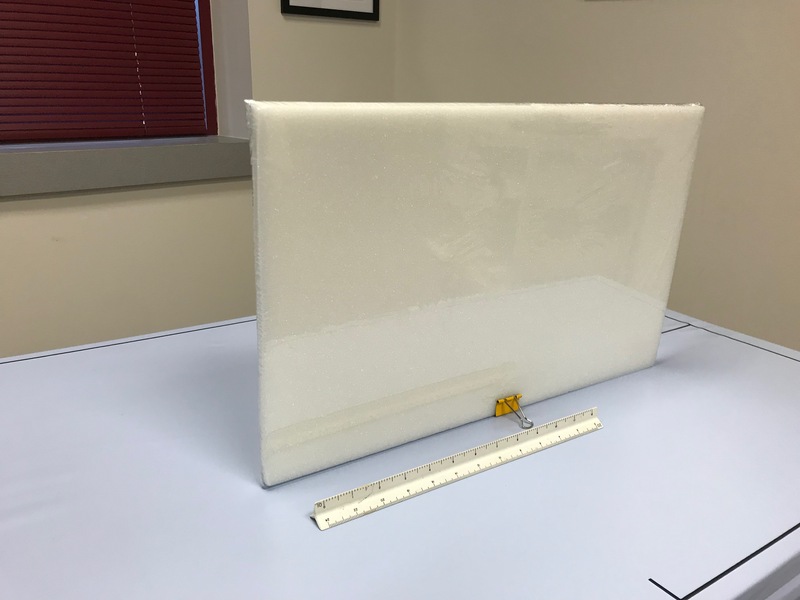 This material has traditionally been used in the construction of X-ray table pads and is invisible to most X-ray admitting devices such as the DXA. Therefore, you can have a portion of this material under the individuals head and neck and it will not affect the results of the DXA scan (see image 4). One issue with RohaCell® is that it can flake a little when handled so we shrink-wrap our RohaCell® support to prevent flaking. The RohaCell® head support that we have created is 20.5 inches x 12.5 inches x 0.5 inches. The support is placed under the DXA table pad and only 5.5 inches is actually extending beyond the DXA table pad. The rest of the support is actually under the individual being scanned. Whatever you decide to do, head or feet outside the scan area, the most important thing is to be consistent and have a standard operating procedure that is followed on positioning athletes in order to maintain accurate and reliable data over time. Of note, and good practice, is to go back and view the previous scan for the athlete to determine how they were positioned so you can repeat the positioning as close as possible. Fryar CD, Gu Q, Ogden CL. Anthropometric reference data for children and adults: United States, 2007–2010. National Center for Health Statistics. Vital Health Stat 11(252). 2012.